Corporate bonds aren’t the most exciting topic, even in the rarefied world of finance. They’re used by companies to borrow money at a fixed rate of interest. Equity investors often ignore them. And compared to the thrills and spills of the stock market, there’s less excitement to be found. In fact, many investors in corporate bonds view them as simply a stable place to tuck away their cash. As you’ll know, since the great financial crisis a decade ago, interest rates worldwide have been slashed to ultra-low levels. One major factor behind this has been the epidemic of stock buybacks. At first glance, these appeal to CEOs because they reduce a company’s equity and lift earnings per share. That boosts both the share price and also bosses’ bonuses. But swapping debt for equity raises the risk profile of a business. This may not seem important when everyone’s making money. When times get tougher, though, for example in a recession, it does matter. If firms start making losses, smaller equity bases can get wiped out more quickly. And when that happens, a company becomes ‘balance sheet insolvent’. Not exactly great for the share price! Other concerns are that debt securities are often bundled together into products known as collateralised debt – or loan – obligations (CDOs/CLOs). These are then sliced and diced into sections (tranches) with different levels of credit risk, and are then sold to debt investors. Sounds familiar? You’re right. CDO failures were one of the reasons behind the great financial crisis of 10 years ago. Investors had convinced themselves that tranching somehow lessened the dangers of buying the riskiest assets. They were very wrong. 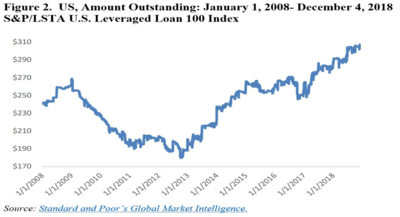 Reinhart notes that CLO new issuance soared to record highs last year, with the S&P/LSTA US Leveraged Loan 100 index about 70% larger in early-December 2018 than at its 2012 lows. And this isn’t just a US bubble. Greater investor appetite for higher yields led to a 40% issuance surge in European CLOs last year. “The networks for financial contagion, should things turn ugly, are already in place”, says Reinhart. Be prepared. Citigroup recently warned that “the heart of the US corporate bond market looks braced for its biggest test since the crisis as a backlash over leverage fuels an ‘internecine battle’ that harms borrowers and lenders alike”, reports Bloomberg. “A narrative of vulnerability will pervade the US corporate bond market in 2019 as an array of mighty US non-financial companies take their turn in the barrel, after spins by financials (2009-12) and energy and metals (2015-16)”, says Citigroup’s head of US investment-grade credit strategy Daniel Sorid. ‘Bond king’ Jeffrey Gundlach, founder of DoubleLine Capital which oversees $121bn of fund assets, believes corporate bonds have a “real potential for negative surprises”. Last year, $51bn in investment-grade debt and just $4bn in the high-yield sector matured, i.e. needed refinancing. But 2019, investment-grade debt maturities jump to $619bn and continue at a rate of between $555bn and $714bn for the next five years, notes Gundlach, equivalent to 62% of the market. What’s more, 45% of high-yield debt will mature by 2023. And the ‘BBB’ segment – the lowest-ranked investment grade debt – has expanded a lot due to lower ratings. 2018’s fourth quarter saw the pace of downgrades from ‘A’-rated territory into ‘BBB’ at its highest since late-2015 when energy prices collapsed. Lower ratings mean that companies must pay more in future to refinance their debt. That damages profits and share prices. 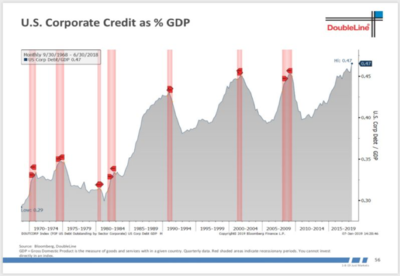 In addition, any further slowdown in economic growth would hit the most indebted firms the hardest. If the latter begin to default, renewed recession would be on the cards. This would create a vicious downward spiral for corporate bonds, while equities – with their inherent greater risks – are likely to suffer even more. Gundlach says that using historical leverage ratio analysis, a massive portion of BBB-rated bonds would actually have junk status right now. He reckons a fresh wave of downgrades could be looming, which the market is now discounting by widening high-yield spreads. This process also crushes stock valuations. To sum up, then: we are faced with a financially-engineered ‘bubble’ market that’s enabling over-leveraged companies to borrow even more but which is about to suffer an interest rate shock on rating downgrades. It’s a horrible prospect for corporate bonds, an even worse one for equities. So how should you protect your portfolio? Holding plenty of cash feels like a good plan. You’ll be able to take advantage of opportunities as the markets fall. In particular, “I think investors need to go to strong balance sheets… [they’re] going to be the way to survive during the zigzag of 2019”, says Gundlach. Tom Bulford looks at a small-cap company which has developed a way to cut costs and improve safety on Britain’s railways – and spin a tidy profit too. You might not realise it, but the ball has already started rolling towards full legalisation of cannabis in the UK. This year will see a resurgence in China’s stock market, says one Chinese businessman. Tom Bulford explains why intrepid penny share investors could be well placed to profit.